The green tech company, Extreme Energy Solutions, enjoys moments in victory lane, partnered with Hall of Famer Jeff Heotzler and rookie driver, Roddy Watts, as Extreme Energy Solutions continues to find success in supporting its Motorsports marketing campaign with brand ambassadors and drivers Tommy Vigh Jr. and Connor Otten. "Veteran Sportman Driver Tommy Vigh enjoys a moment in coaching ARCA Driver Tony Mrakovich on how to maneuver around the Orange County Fair Speedway's famed 5/8 mile Hard Clay track." The 2017 racing season marked the largest effort yet by Extreme Energy Solutions in advancing its product brands within the racing community and beyond. Putting its support behind main stay veteran drivers Tommy Vigh Jr. and Connor Otten, as well as adding to the roster rookie Roddy Watts and Hall of Famer driver Jeff “the Jeffer” Heotzler, gave Extreme Energy Solutions the momentum it was looking for in promoting its brands and expanding their reach of retailers who offer Extreme Energy Solutions products. For the historic running of 56th Eastern States Weekend (2017), ARCA Rookie Tony Mrakovich joined the team in the H2O Energy Flow Sportsman ride. 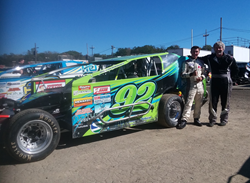 Behind the #92 Extreme Kleaner/Extreme Energy Solutions Sportsman ride was Tommy Vigh Jr. Vigh finished 15th in the points, had a season high of top five finish, and would be seen regularly finishing in the top ten at the Orange County Fair Speedway. Vigh also qualified for the 50 lapper at Eastern States Weekend; where he would finish a very respectable 8th place in the running. Smart Emissions Reducer/Extreme Energy Solutions provided support to the young gun Sportsman driver Connor Otten, who advanced his newly established career ahead as he also had a top five finish and a few top ten finished. 2016 was his rookie season, with 2017 was his first full season as a veteran driver. Otten finished 20th in the points standings. Otten also closed the door in at the ESW contest with a 7th place finish at OCFS. “Our sponsors were great and provided the much-needed boost so that we could make for a good showing each week. We aim to do even better in 2018. There were unexpected challenges near the end of the season, and that put us out for a few weeks. We were able to push through, staying within the top 20 in points, which I deem not a bad year for my second go around,” contributed Otten. Rookie Sportsman driver, Roddy Watts, found himself in victory lane for his first career win, powered by Extreme Xtra Fuel Treatments/Extreme Energy Solutions, and the #22 machine. Watts also achieved a second, third, and fourth place finish, while his other two finishes were later in the pack, as a contender at OCFS. The Jeffer himself, Jeff Heotzler Sr., made it back to his home track in 2017, gaining support from Extreme Energy Solutions. Over the winter, the Hall of Famer came back to the Hard Clay. Heotzler found victory lane in 2017 with a Big Block Modified race win. He finished 20th in points. “I wish I could have gained more wins and put the Extreme Energy Solutions/Four Star Modified in victory lane more often. We tried some new things and will be back at it next season,” claimed Heotzler. Joining the team for a chance to start in the Eastern States Weekend contest, was ARCA driver Tony Mrakovick. Mrakovick began the day in the H2O Energy Flow machine, which was pulled from the track due to engine failure. Friends of the Extreme Team then lent Mrakovick their ride, which then Mrakovick tried to make a bid in his heat qualifiers and last chance consi race. After the 4ny car lent to the team by the Johannsen Brothers broke, Mrakovick was on the sideline for the night. Leveraging the success on the track, Extreme Energy Solutions utilized this advantage for commercial gain off the track. Extreme saw its product lines become adopted by retailers and wholesalers in and around the sport. Extreme Kleaner, H2O Energy Flow, and/or Extreme Xtra Fuel Treatments can now be found in almost 500 stores nationwide and over a dozen places online. Extreme has integrated the marketing power of racing as part of its branding, attracting consumers coast to coast. Extreme also announced the winner of its 2017 Product Sponsorship Program, which includes a split between Sportsman Jeff Hulusapple, pilot of the #14 Vital Motorsports ride and Tyler Boniface, who competed in double duty, seeing sprint car action behind the wheel of his #69 Small Block Modified. Each driver-team together will get $250 as they have been named Extreme Energy Solutions 2017 Product Champion. To win as a product champion, each driver and team had to give their best as a brand representative to the sport, both on and off the track.